Star vs the Forced of Evil is heading into its season finale and Star finale has a force of evil to fight… besides systemic racism. I am hyped. I finally got around to watching the Castlevania netflix series and i didn’t really like it as much as i thought I would. The thing is if they just had some hype castlevania music plaing during the action scenes I probably would have liked it a lot more. But right now i’m just thinking it was ok and maybe i’ll watch a second season. Yeah it didn’t completely blow me away like it seemed to do to some people. Really does need classic music and sound effects. It wasn’t bad. I will watch season 2, it isn’t a huge time commitment which is also attractive. Yeah that is heart wrenching. Truly a living legend. Until recently my anime consumption had been sparse. The last big anime I saw was Sword Art Online. I didn’t even finish it I roughly saw the first 10 episodes or so. It singlehandedly turned me off anime for a long time. If some of you love the anime great but to me it was a combination of anime tropes left and right and I couldn’t unsee it. At the time I also wanted more from anime and I felt the most interesting and compelling stories were on TV. While anime can certainly produce compelling stories I had forgotten that anime could also be fun and silly and that’s why I’ve recently been on sort of an anime binge. Dubbing has also been a big part of why I’ve watched a lot of these recent anime. While I have no problem listening to the Japanese VO it has made it easier to stick to the dub. Some of you are probably yelling “blasphemy!” but hey it’s been much more enjoyable for me. If it wasn’t for that I wouldn’t had been able to get into My Hero Academia, One Punch Man, and Mob Psycho 100. I actually started My Hero Academia in Japanese but felt the dub was just as great and would made the story easier to understand and get into. Dragon Ball has sort of had a big resurgence in my life and it’s all because of Super. When I was younger I was a huge fan of DBZ all the way to the Majin Boo Saga and even GT. But, when Super came out I had no interest whatsoever and for a long time I would catch a glimpse of the show and think “it doesn’t look that good” and forget about it. However, a month or two ago my sis wanted to give Super a try and really watch it from the beginning and it made me remember why I love the show so much. It’s been a blast and i’m now caught up with all the Toonami episodes. P.S. Two anime that I still watch with Japanese VO are Attack on Titan and Naruto/Boruto but I think I might go with the dub for season 3 of AoT. And, honestly the Boruto stuff has been mediocre. I think i’m done watching it that is if they ever do the growth spurt again then I might check it out. SAO is really, really bad. I’m with you there. Yeah SAO was pretty bad. It started with an alright premise but yeah it really turned terrible. There’s anime about all kinds of stuff you just got to try and find what you like. I’ve heard the name but never really actually paid attention to it. Thanks for the suggestion though. I’ll keep it in mind. Well its definitely awesome if you ever get the chance. Been watching Fist of the North Star. It was bitter sweet when the Lex Lang dubbed episodes ended. Those were my first exposure which was obviously impactful in my life. As a random note, My Hero Academia is joining the Toonami lineup this weekend in the 11:30e slot for those that might be interested. Digimon Adventures Tri 6 Our Future is on crunchyroll. Part 5 had me worried but I liked how this ended, with consequences. It’s kind of impressive the loops they jumped through to not include the 02 kids, but what happens to them is shown. Also another digimon project is being teased. Which makes sense. The 15th anniversary project ended just in time for the 20th anniversary. Also there’s blood… lots of blood. I am going to give that a try. Wotaku ni Koi Wa Muzukashii – This is really good. Megalo Box – Awesome boxing show. Seemingly has nods to Ashita no Joe. Dorei-ku the animation – SCM’s are dangerous. Strangely enough semi realistic in that its basically giving you mind control drugs. Rokuhoudou Yotsurio Biyori – Thought this was a Shounen Ai don’t let the Bishonen fool you. Happily I was wrong. Turned out good. Hinamatsuri – This turned out pretty good actually. Piano no Mori-Great piano anime. Hisone no maso-tan – This is okay just a bit weird. Jikken-hin Kazoku: Creatures – Was okay about a family of experimental children. Mahou Shoujo Site – This was alright. Has the Frieza Japanese voice actor :). Caligula- Its interesting will have to see where it goes. Tada Kun Wa Kai Wo shinai – This was okay. Its a slice of life romance so probably not your thing. 3D Kanojo Real Girl – This was okay for what I watched of it. Gurazeni – Its really slow and focused on baseball salaries so the genre probably hampers it. Uchuu Senkan Tiriamisu – Its okay but its short. Sared Tusumibito Wa Ryuu to Odoru – I just wasn’t interested. Mahou Shoujo Ore – Its kind of confusing. Magical girl that gets gender bent. Comic girls – The genres keep it from being interesting. Uma Musume Pretty Derby – Terrible. Its about horse girl idols. Kakuriyo no Yadomeshi – haven’t seen yet. Devil’s Line – Haven’t seen enough but didn’t look special. Gegege no Kitarou – haven’t seen yet. I enjoy the Golden Kamuy manga. I need to catch up on a couple volumes. 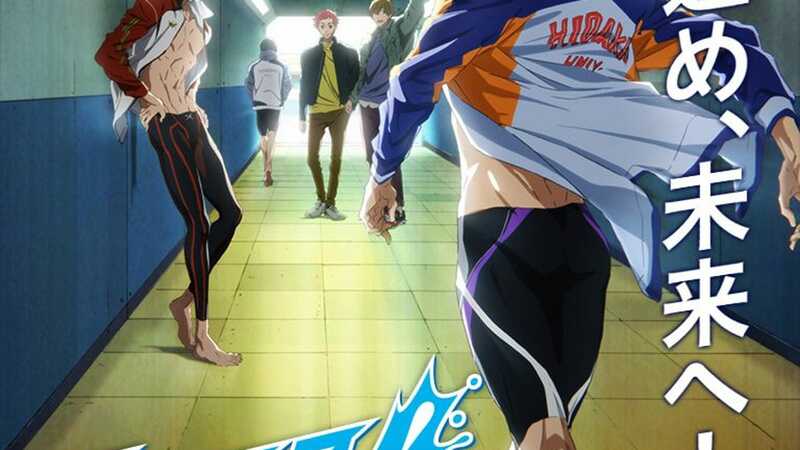 Free!, the swimming anime with shirtless anime boys, is getting a new series this June. It’s called Free!-Dive to the Future- and, if the teaser art is any indication, it won’t disappoint in the shirtless department.